Update: It’s been brought to my attention that not defining primary keys as not null does have an impact after all, refer to Dale McGowan’s comment below. Suffice to say, I will continue to define them as not null from now on! Much like a musician who despite getting the right sound realises they've been playing their instrument wrong throughout their career, I often find I'm not using computer software properly or I've been wasting effort. I guess I get myself into a predictable routine that I'm used to. In this case I found out something about Oracle databases. I've been using them for years, but it took a practical class at university yesterday to realise I've been wasting time with a simple line of code that was completely unnecessary. If you do any sort of work with databases you'd probably want to smack me on the head for this, but I didn't know that primary keys are automatically assigned as not null; presumably because it doesn't make logical sense and it would break a table to have a primary key that has null values! 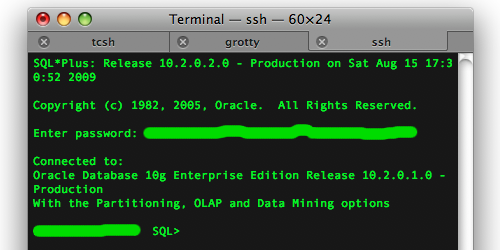 That's right, both these schemas will result in the same table being created in Oracle. I guess it wasn't harming anything having the not null command there, it was just unnecessary. Newer post ← Grabbing an IBM Thinkpad X40! Older post → #Anime Akiyama Mio just a moeblob… so?